For a change of pace, today I’m sharing with you a dinner recipe that is perfect for this cold weather! In case you’ve been wondering why I don’t share many entrée recipes, it’s not because I don’t like them, or because I never make them, or because I think they’re boring. On the contrary, I have been cooking quite a few meals lately that I would love to share with you. But I’ve been saving them for a project I’m working on. I don’t know yet when it will be released as progress is slow, but hopefully within the next few months you’ll be seeing an ebook from Briana-Thomas.com. I’ve been asked a lot about the possibility of a hard-cover cookbook, and that is definitely something I would like to see in the next year or two. Until then I’ll probably publish a few ebooks to raise funds (I’ve found out that cookbooks are expensive to publish!). Stay tuned! Update: I am now working on a cookbook! Hopefully it will be published in the fall of 2016. Update – Update: You can find this recipe in my cookbook, Necessary Food! So about this soup…it’s been dubbed “Our Favorite Soup” for obvious reasons. 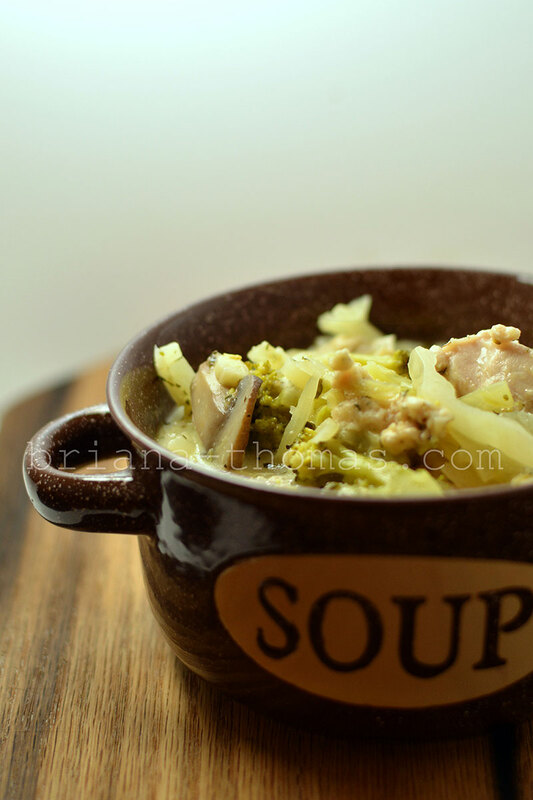 This soup has it all: a creamy, flavorful broth; tender chicken; lots of veggies; green chilies; garlic; and fresh mushrooms. Oh, and BACON. A note on the red pepper – our family isn’t big into spicy, so I usually just omitted red pepper from recipes that called for it. While I’m still not a huge fan of spice that makes my nose run (let me eat in peace! ), I’ve found that just a touch of red pepper helps round out the flavor while not totally overwhelming my sinuses. And of course, if you like heat, load it on. Oh, and thanks go to my friend Heather for giving us some nutritional yeast! 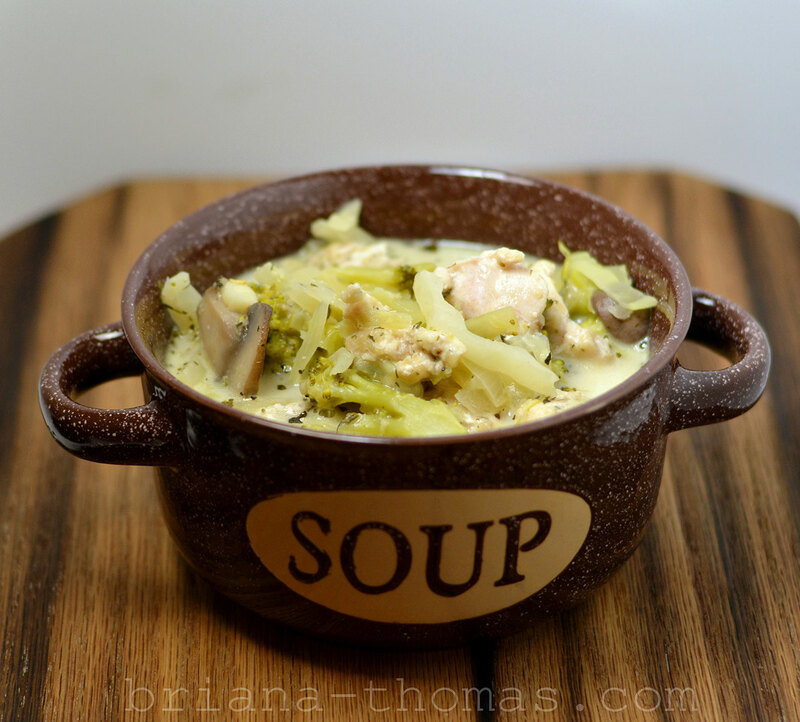 I had never tasted it before, but pulled it out to add some extra flavor when I made this soup. It did not disappoint. Don’t leave the nutritional yeast out if you don’t have it! It really adds to the flavor of this soup. If you don’t have nutritional yeast, a) buy some, and then b) if it doesn’t come in time, add some additional chicken base to bring up the flavor. You can snag my official pin for this recipe here. In a nonstick skillet, cook the chicken and turkey bacon together until cooked all the way through and the juices run clear. Meanwhile, in a large soup kettle saute the cabbage and onion in the butter (cover the kettle with a lid and stir occasionally). After it has cooked for a bit, add the water and broccoli and let the vegetables cook until they’re crisp-tender. Add the mushrooms, chilies, and all the seasonings and let the soup simmer. When the chicken is cooked through, add it to the soup, juice and all. Add the cheese, unsweetened almond milk, and cream (don't boil the soup after this point) and let everything simmer together until the cheese is melted and dissolved. Taste and add salt if needed. Yields 12 servings. Serve with shredded mozzarella cheese if desired. Fantastic!! 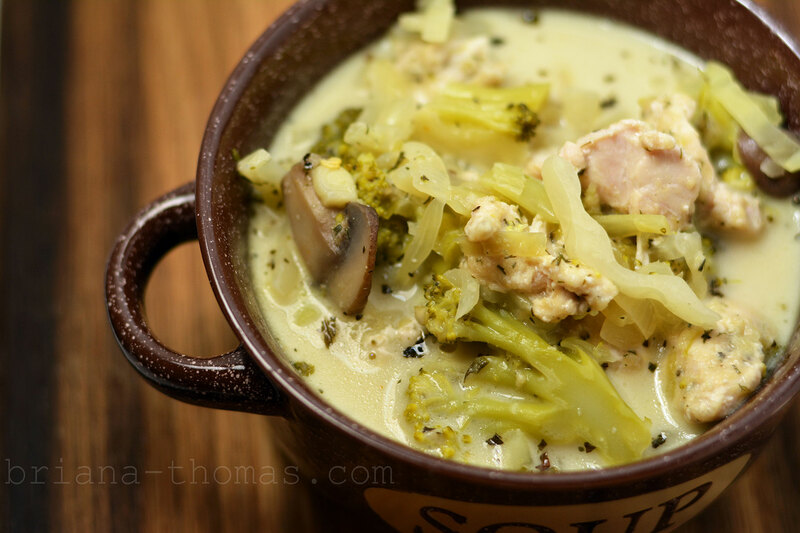 This is now one of my favorite soups! Thank you for sharing the recipe. I made it pretty much as you listed it. The only exception was I swapped out turkey bacon for chopped up turkey sausage links. Yum! I really enjoy this soup! Thanks for all your yummy recipes! Hi, Briana! I had not been web-surfing for new THM recipes for quite a while and just found your “new” site! It’s awesome! I am doing a fuel cycle week so I was searching for FP recipes yesterday (btw – they seem to be hard to find -hint, hint – we could use more of them!). I adapted this soup by cutting out the butter, heavy whipping cream and cheese, and it was still delicious, though I know it would be even more creamily delicious with all that fat in it yet too! Thank you so much! Have a great time at Bible School! I was at your church on HBS gospel team back in … uhhh, before you were even born… 1992! God’s richest blessings on your service here! I am thoroughly enjoying your delicous recipes! I am so thankful I came across your blog and I can’t wait to make this soup. You seem to enjoy a lot of the same things I do so it has been fun to see what I’ll find here next:) I am a mama to 7 children and to have someone else figure out recipes for me has been a tremendous blessing and made the THM journey much easier and fun! Blessings!